Google Reader: Why did everyone’s favorite RSS program die? What free Web service will be next? And what free Web service will be next? I’ve made it pretty clear that I don’t like RSS readers. When you subscribe to your favorite sites and read all their articles in a single, text-heavy interface, you’re eliding the beauty and variety of design on the Web. You’re also turning news reading into a chore. Or, at least, that’s what I felt—with its prominent, hectoring count of all my unread posts, opening up Google Reader was as stressful as dealing with my email inbox. And I want the Web to be fun, not stressful. So when Google announced this week that it would soon kill Google Reader, I wasn’t bothered in the least. I might even have said a few mean things about it on Twitter. But enough about me. Let’s talk about you. 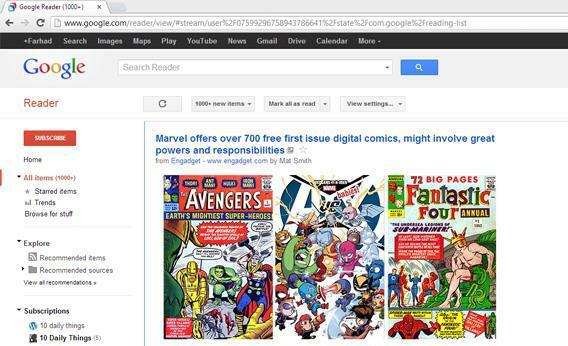 You didn’t just love Google Reader. No, your feelings about it were much deeper—you relied on Google Reader, making it a central part of your daily workflow, a key tool for organizing stuff you had to read for work or school. Now it’s gone, and you feel lost. Sure, there are alternatives, and transferring all your feeds to one of these will probably take just a few minutes. But that won’t be the end of it. You’ll still have to learn the quirks of your new software. You’ll still have to get the rhythm down. And most of all, you’ll still worry about abandonment. Google says it killed Reader because the software’s usage was on the decline. But Google Reader was the most popular RSS reader on the Web. If people were quitting Reader, aren’t they likely to quit the alternatives, too? I feel for you. I really do. While I didn’t use Reader, Reader-lovers’ plight could happen to any of us. Every day, our computers, phones, and tablets harangue us to try new stuff—new apps, new sites, and new services that will supposedly make this or that thing so much more awesome than before. You’re aware of the dangers of committing too hastily, so before you get too invested, you diligently check reviews and solicit opinions from tech pundits like myself. But when all those assessments converge, who can blame you for getting in too deep? Back in 2005, when Google launched Reader, the company talked about it like they’d keep it around forever. And they probably thought they would. You took them at their word, and now you’ve been burned. That’s why we should all consider Reader’s death a wake-up call—a reminder that any time you choose to get involved with a new app, you should think about the long haul. It’s not a good idea to hook up with every great app that comes along, even if it’s terrifically innovative and mind-bogglingly cheap or even free. Indeed, you should be especially wary if something seems too cheap. That’s because software is expensive. To build and maintain the best software requires engineering and design talent that will only stick around when a company has an obvious way to make money. If you want to use programs that last, it’s not enough to consider how well they work. You’ve also got to be sure that there’s a solid business model attached to the code. This calculus becomes especially difficult with software made by Google, a company that doesn’t charge for much of anything, isn’t transparent about how its products make money, and is fond of experimenting with lots and lots of new products (and, lately, of killing off stuff that’s not part of its central mission). There are many free Google products that you can use without worrying they’ll go away. Search is Google’s main moneymaker, so there’s no risk there. Chrome is pretty safe, too, as it boosts traffic to the rest of Google’s menagerie of products. Gmail displays ads alongside your email, but its real value to Google is the way it pushes you to stay logged in to your Google account, allowing the company to learn more about your travels across the Web (and, thus, feeds into its ad revenue). So there’s no risk Google will kill Gmail. Similarly, the free version of Google’s online productivity software, Docs, doesn’t make much money on its own, but it’s crucial to Google’s Chromebook project, so it’s probably OK. And then there’s Google+, the search company’s beleaguered social network. Sure, it’s a ghost town—in fact, according to BuzzFeed, the supposedly declining Google Reader drove more traffic across the Web than Google+. But Google’s efforts to deeply integrate its products into Google+ shows that it is heavily invested in making it work. So if you’re that one guy using Google+, don’t fret. There are several other Google products I’m not so sure about. At the top of my list is Google Voice, which assigns you a phone number that rings all the rest of your phones. I’m deeply invested in Google Voice—I use it as my primary phone number, so if it were to shut down, I’d have to send new digits to all my friends and professional contacts. Why am I worried that it will vanish? Because Google Voice has no clear business model. Google won’t take my money for it. It’s been years since the company updated the service in any significant way. And Voice loyalists have alerted me to troubling warning signs—last year, for instance, Google moved a link to Voice from the drop-down menu labeled More in its navigation bar to a deeper, nested menu labeled Even More. Was this change significant? I have no idea. But it’s not encouraging—just troubling enough that I should probably begin to look for alternatives from companies that will take my money. And Orkut. Oh man, why on earth is Orkut still around? Seriously, Orkut users, you’re asking for trouble. Pack up and move elsewhere. You may have heard that Orkut is still popular in Brazil. It’s not; Facebook has eclipsed it even in Brazil. The end is nigh. Reader’s death provides useful lessons even for software not made by Google. In particular, it reminds me that when I really get into software that does have a pay option, I should pay for it. I did this with Workflowy, the outliner that I raved about last year. I use it so heavily that I couldn’t justify not paying the $5 a month for it; if heavy users like me don’t pay, no one will, and then Workflowy will likely go away. I also pay for Freshbooks, and I send Google money to get extra storage in Gmail. If I were a more diligent Evernoter, I’d pay that company, too. I encourage you to do the same, if you can afford it. Free stuff online is great, but nothing is free forever. If you care for something, open your wallet.